IP Result of anti-ZEB1 (IP:21544-1-AP, 4ug; Detection:21544-1-AP 1:500) with MCF-7 cells lysate 4000ug. 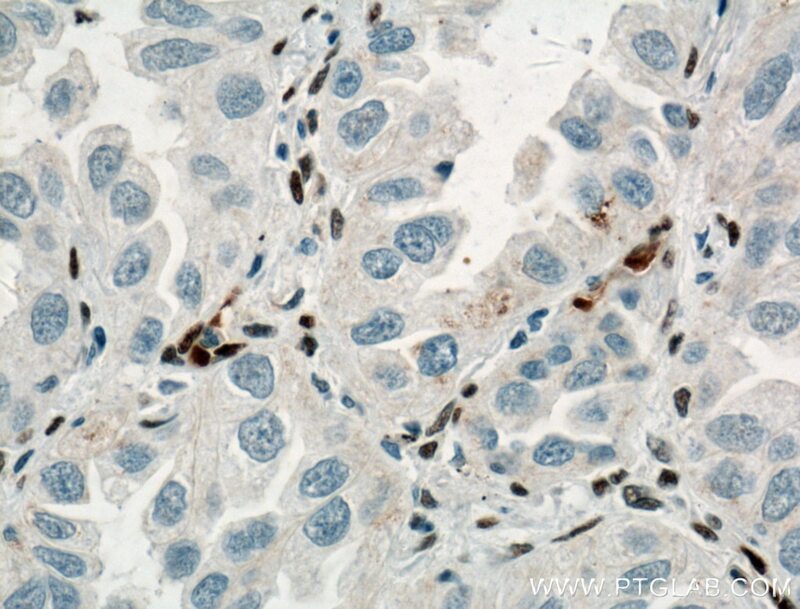 Immunohistochemical analysis of paraffin-embedded human lung cancer tissue slide using 21544-1-AP( ZEB1 Antibody) at dilution of 1:500 (under 40x lens). heat mediated antigen retrieved with Tris-EDTA buffer(pH9). 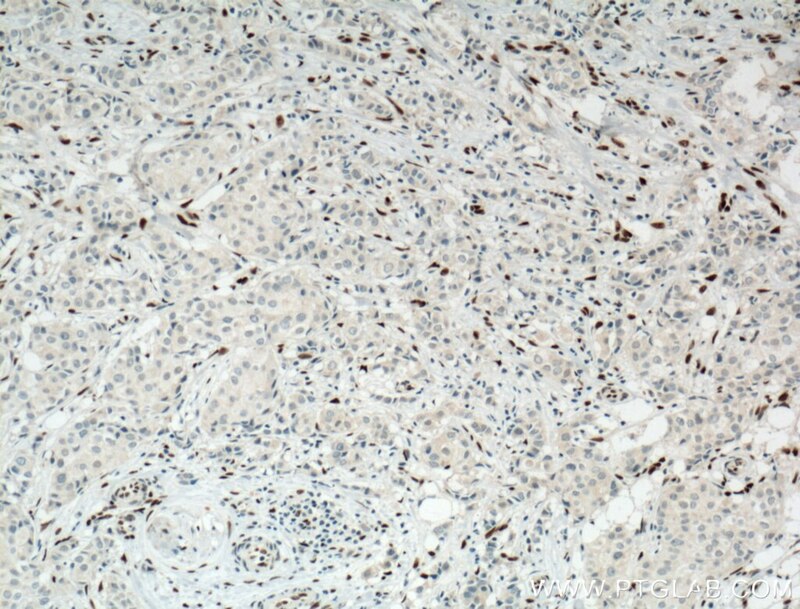 Immunohistochemical analysis of paraffin-embedded human breast cancer tissue slide using 21544-1-AP( ZEB1 Antibody) at dilution of 1:500 (under 40x lens). heat mediated antigen retrieved with Tris-EDTA buffer(pH9). ZEB1(zinc-finger-enhancer binding protein 1), which is a members of the Zincfinger-Homeobox (ZFH)-family of repressors, acts as a transcriptional repressor that inhibits interleukin-2 (IL-2) gene expression. Depending on the quantity of cDNA and on the cell type, ZEB1 can enhance or repress the promoter activity of the ATP1A1 gene . Represses E-cadherin promoter and induces an epithelial-mesenchymal transition (EMT) by recruiting SMARCA4/BRG1. Represses BCL6 transcription in the presence of the corepressor CTBP1. Positively regulates neuronal differentiation. The calculated molecular weight of ZEB1 is 124 kDa, but the post phosphorylation of protein is about 190-210 kDa. 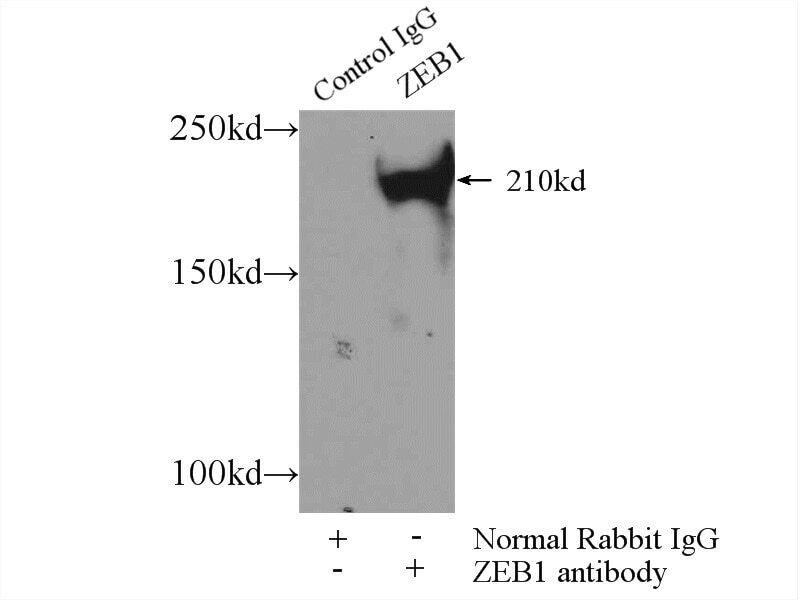 This is a rabbit polyclonal antibody raised against part of the full length of ZEB1 of human. Zeb1 Is a Potential Regulator of Six2 in the Proliferation, Apoptosis and Migration of Metanephric Mesenchyme Cells. ZEB1 stimulates breast cancer growth by up-regulating hTERT expression. Downregulation of DAPK1 promotes the stemness of cancer stem cells and EMT process by activating ZEB1 in colorectal cancer. SSRP1 promotes colorectal cancer progression and is negatively regulated by miR-28-5p. Zeb1 is important for proper cleavage plane orientation of dividing progenitors and neuronal migration in the mouse neocortex. LincK contributes to breast tumorigenesis by promoting proliferation and epithelial-to-mesenchymal transition. 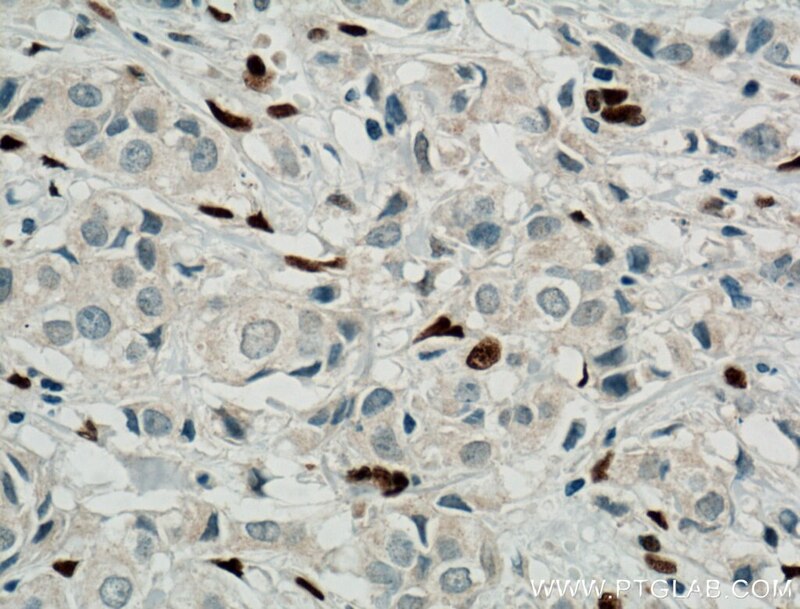 Immunohistochemical analysis of paraffin-embedded human breast cancer tissue slide using 21544-1-AP( ZEB1 Antibody) at dilution of 1:500 (under 10x lens). heat mediated antigen retrieved with Tris-EDTA buffer(pH9). 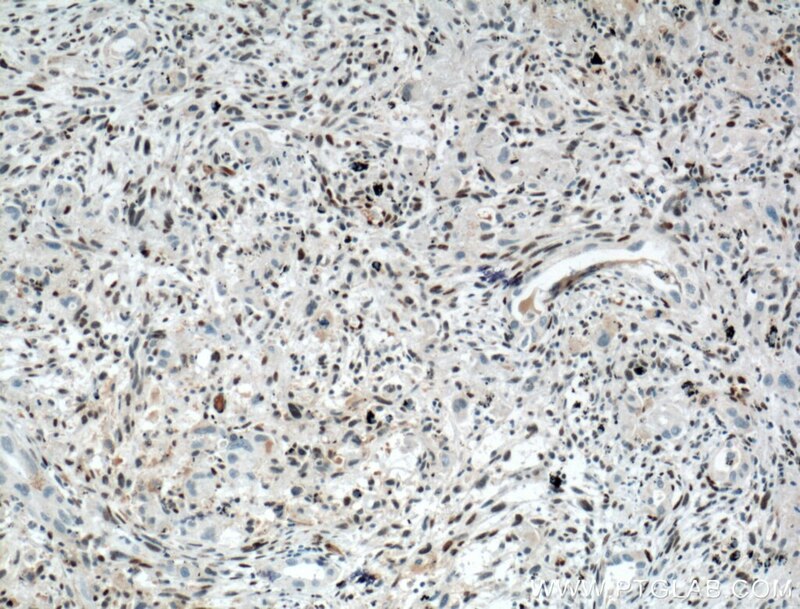 Immunohistochemical analysis of paraffin-embedded human lung cancer tissue slide using 21544-1-AP( ZEB1 Antibody) at dilution of 1:500 (under 10x lens). heat mediated antigen retrieved with Tris-EDTA buffer(pH9).